There comes a moment every so often when I read something and it forces me realize that I read A LOT. So much that some things are good, others are just ok for entertainment... and then the rare finds that simply take my breath away and remind me why I love the power of literature so much. Jessi Kirby has left me with those feelings (and so much more) with Golden. It's a story that resonates deep within me and I have the urge to experience it over and over again. It's a simple story, really. A girl living by the rules her whole life; always doing what's right and expected from her. But then a moment presents itself, allowing her to make a choice. Do something bold and daring, that no one would expect? Or follow the path that's been handed to her? Right from the beginning this story caused me to reflect on my own life. I found myself evaluating my own choices and deciding if I, too, chose the comfortable path. When a story hits you so hard that it causes personal reflection, you realize something amazing is unfolding on the pages. There is a story inside a story with this one. Parker Frost finds a journal that's been written 10 years earlier by a graduating senior who devastatingly crashed in a snow storm one fateful night. Her and her boyfriend's supposed deaths have been the town's nightmare, but also part of its history. In their memory, a scholarship has been made for graduating seniors to pursue their dreams, that were cut way too short for them. Parker is in the running to receive this scholarship, but the journal uncovers stories and truths that have been dormant for far too long, causing Parker to reevaluate her own life and look more deeply at the choices she's about to make. I love how Kirby took us inside the story of the journal, but still kept it relevant to Parker and her present day story. The two worked so beautifully and left me guessing what would come next. Golden is not just a story about Parker, and the choices she makes; but it's also about the supporting cast and how their choices reflect those around them -- for better, or worse. Jessi Kirby has been a favorite author of mine because of her previous novels, Moonglass and In Honor, but there is something so unique about Golden that stands out from the others. Her growth as a writer is obvious in the words she weaves around this bittersweet mystery. Kirby's storytelling really took form in this one and submerged me, as the reader, right into the novel itself. The references to Robert Frost's poems throughout swept me away and worked so beautifully with the story she created. Golden has reminded me to be bold, be daring, choose something out of the ordinary; because you never know where that path may lead you... unless you try. I NEED to read this one, it sounds pretty amazing. I love stories that you can actually relate to and make you think deeply about your own life. Also need to pick up her previous books, I've never read anything by Jessi Kirby and she sounds like a great author. 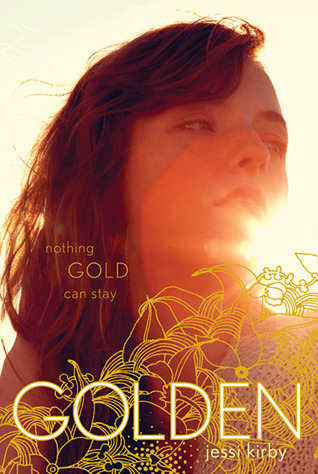 Golden was so incredibly beautiful, and I feel lucky to have read it already as well. It was a book that made me think about my own life, and all because I identified so well with Parker. Your review is so wonderfully written - and you've gotten me excited to have a finished copy in my hands next month! I am SO EXCITED to read this one! Everyone says such lovely (& golden!) things about it. It sounds like a book that really resonates with people and I can't wait for it to resonate with me as well. Wonderful review, Ginger! All the book bloggers I'm following on twitter have mentioned AMAZING things about this book! Totally already added to my TBR shelf on goodreads. Sounds like a really great reading experience!